And Here We Go! 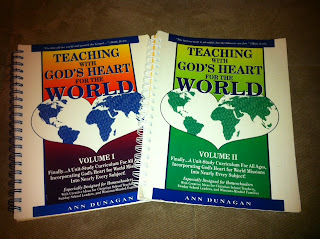 : Free Christian Missionary Curriculum! So, sometimes I'll encourage people to share their favorite resources (and even if I don't specifically ask, I always love it when you share! ), and most of the time no one does. No worries. I don't have a lot of time to go commenting on other people's blogs, too. However, SOMEONE SHARED on my Cycle 1 Christian Missionaries and Heroes List! The Carpenter family shared a link to a completely wonderful, fabulous, and FREE one-year (day-by-day, week-by-week!) missionary curriculum! THANK YOU, FRIEND! Wow!!! It's pretty long (500 pages), so I haven't read through all of it, but what I've seen looks incredible for elementary-aged kiddos. As you can tell, I'm super excited about using it with my girls. Click on the link below and check out the titles of the chapters. Insanely awesome! Click here to check it out and download this free curriculum. But, don't just take my word for it. Check out the Old Schoolhouse Magazine review! Don't you just love it when people share?! Thanks again, Carpenter family! Oh yay! I linked to you from Half A Hundred Acre Wood. But I just had to say the author of the curriculum is the real thing. She's a friend of ours! That's so great to hear that she's the real deal! I'm really enjoying her work; I can't imagine how long it took to put these volumes together. Wow! Please tell her I said thank you. I know this will be a wonderful resource for my own family! :) God bless you! Brilliant idea! Continue to spread word of God and make Him famous! To God be all the glory! Great post,thank you for sharing this with us! Choosing a homeschool curriculum is difficult for most of the parents and visit Online homeschooling,it provides best curriculum for every individual. An attractive way to engage people of God for the Instructions given by God for Life.This is an Holly effort related to religion through pay for my essay to bring people near To God by her own words.